Incredible Hulk comics have held sway over the imaginations of many comic fans over the years, while more dashing heroes like Spider-Man, Superman, Batman, and Wolverine get most of the hype. The Incredible Hulk was a surprising 'smash' and stole the show during the recent smash hit Avengers movie. Despite the ultimate popularity of the Hulk, the series has not simply run in unbroken fashion since its beginning. Indeed, the original The Incredible Hulk comic ran from just 1962-1963. 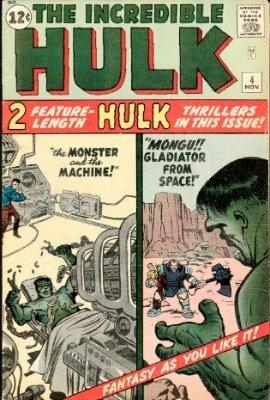 Those familiar with the many transformations of the Hulk might be amused that for Incredible Hulk #1, the Hulk is gray, but on Incredible Hulk #2 and on, he is green. Clearly, there were some kinks to be ironed out in those early days. What is not a laughing matter is the astonishing value of high quality copies of those early The Incredible Hulk issues! 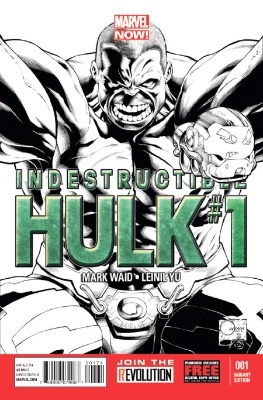 First issue has Hulk with gray skin; he will not be green until issue #2. If you have discovered an old copy of Hulk #1, then get in touch. We'll value it for free. See more details on Hulk comic #1 here. Now the Hulk is colored in his more familiar green skin. Get in touch with photos if you come across a copy of Hulk #2, and we will be happy to appraise its value. Much of the most important thematic material is played with in the short-lived (six issues) first run of the series. Early issues see the Hulk emerging and taking over at sunset, while later he responds to different sorts of triggers. Also, we see Banner able to establish a certain degree of mental control over the Hulk. This control is unsteady, though, and we can see the potential for a sort of ongoing Faustian struggle developing here. 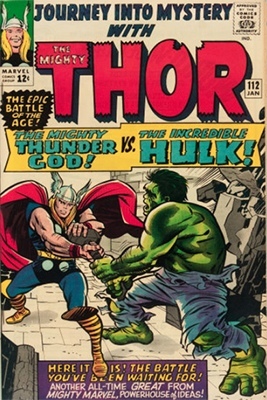 After the end of the series, the creators did continue to demonstrate their commitment to the Hulk, by moving him into the Avengers lineup. 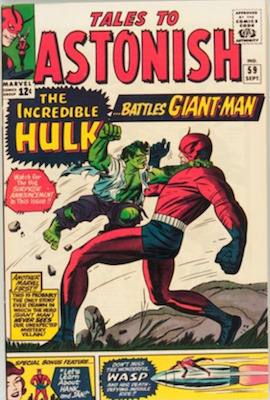 The Hulk/Bruce Banner character was preserved by being moved into Tales to Astonish, beginning with Tales to Astonish #59 (though Hulk was officially installed in Tales to Astonish #60). He shares billing with Giant Man. 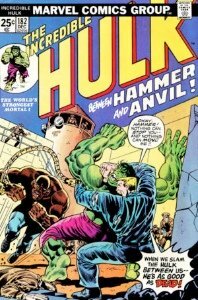 As you can imagine, there is a spike in value of those issues of Tales to Astonish corresponding to the Hulk's entrance. This Hulk matured into the Hulk we recognize today, with the neon green skin, detailed musculature, and purple jean cutoff shorts. 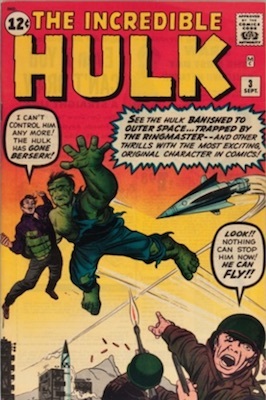 Eventually, the Hulk managed to push the less exciting Giant Man aside, and the comic was retitled as a solo feature. 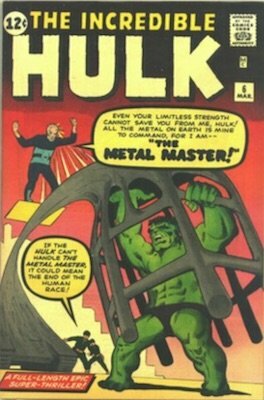 In between, beginning with Tales to Astonish #70, the title disappeared in favor of the characters' names, and the stories were split between the Hulk and the Sub-Mariner, with Giant Man departing to seek his fortune elsewhere. The numbering continues from Tales to Astonish, with Incredible Hulk #102 as the first issue of the new volume. This could be confusing for budding The Incredible Hulk collectors hoping to add issues 7-101 to their collection. After all, those issues do not exist! 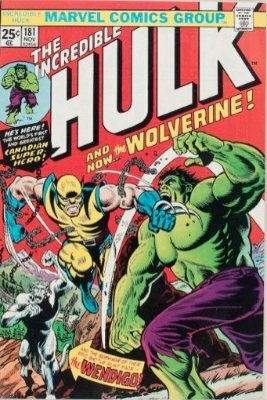 One prize issue is Incredible Hulk #181, which debuts Wolverine! 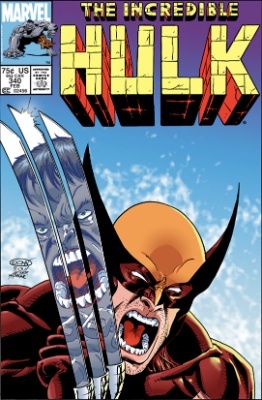 Although Wolverine did appear in Incredible Hulk #180 as a teaser, 181 is the first full appearance of everyone's favorite clawed, regenerating tough guy. This is before Wolverine became an X-Man, but he's sporting his characteristic blue and yellow costume. Incredible Hulk #182 is also a desirable issue to have. Somewhere between Incredible Hulk comics #324 and #331, the Hulk transforms into the Grey Hulk. Grey Hulk has the ability to remain transformed perpetually. He takes on Banner's intelligence, but uses it for evil. He’s not as strong as the Green Hulk. Grey Hulk's nom de guerre is Mr. Fixit, and he often serves in the capacity as a mercenary thug. Incredible Hulk #331 also marks the entrance of Peter David as writer, for the bulk of the rest of The Incredible Hulk, volume 2's run. Incredible Hulk #340 is a Macfarlane Wolverine comic, and a minor key issue. The artistic difference between this and the original Wolverine from #180-181 is stunning. The Incredible Hulk racked up an impressive number of issues, running to #474. These two titles are really one series published in the late 1970s. It's quite obscure and hard to find in very high grades. For understandable reasons, comics creators want to have readers think of the comic in terms of narrative and backstory, rather than the vicissitudes of the publication and marketing process. 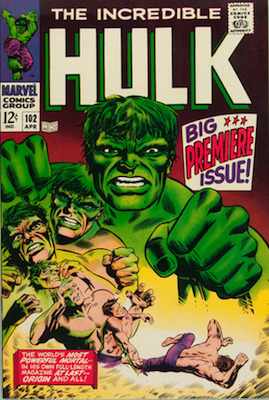 To this end, Marvel introduced a magazine style The Rampaging Hulk in 1977, intended to fill in the "lost years" between volumes 1 and 2 of The Incredible Hulk. This was a black-and-white series. 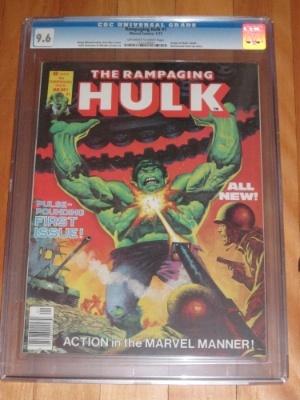 The Rampaging Hulk was cancelled (see below) in 1978, and revived briefly in the late 90s. 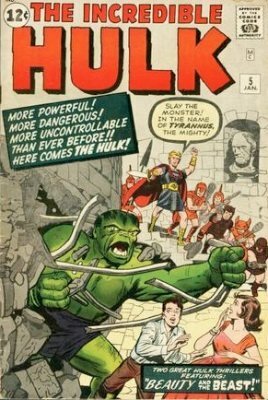 Beginning with issue #10, The Rampaging Hulk became The Hulk! Like its predecessor, The Hulk! was printed in magazine format. The Rampaging Hulk/Hulk run ended with issue #27 in 1981. The 1999 relaunch of the Hulk title saw the return of writer John Byrne, who'd already overseen a brief run of issues of The Incredible Hulk comics. 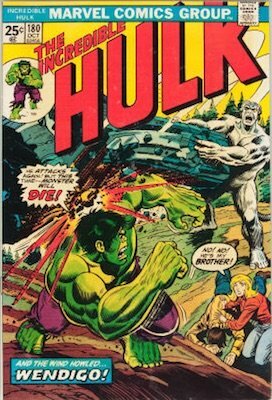 Byrne didn't last on the new Hulk either, and the title was scuttled in order to return to The Incredible Hulk. After a seemingly unnecessary divergence into the Hulk title, The Incredible Hulk returned in 1999, beginning with issue #12. Early in this series, the Hulks continue to multiply, with the addition of a Devil Hulk. I guess the idea here is that an id can have an id? 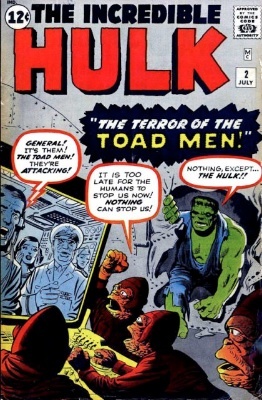 Who knows, the point is that it sets up the possibility of a spectacular, Hulk-filled conflict. The most bizarre twist in the publication life of the Hulk came in 2008: at issue #112 of The Incredible Hulk, the series became The Incredible Hercules, featuring a modern-day Hercules. Shifting to a new title after the dawn of The Incredible Hercules, Hulk starts off strong. The series introduces Red Hulk, a high-ranking officer named Thaddeus Simmons who was friends with Bruce Banner's father at the Los Alamos nuclear testing and development facility. The relaunch issue has a host of variants. One issue worth having is Hulk #14, specifically the Ed McGuinness cover featuring Red Hulk and Deadpool. 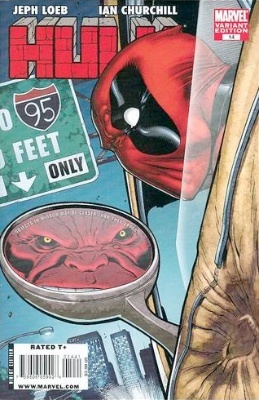 #16 has an impressive (if bizarre) Deadpool variant as well. The last five issues, 53-57, are part of a series called Mayan Rule. Afterward, the title made yet another jarring shift, with Hulk becoming Red She-Hulk. This title featured a heroine previously introduced in Hulk. Red She-Hulk is Betty Ross, the daughter of Red Hulk and the former fiancée of Bruce Banner. The last resuscitation of the The Incredible Hulk title? This one lasted from just 2011-2012, intersecting with the Marvel NOW! event. The #2 issue Marc Silvestri variant, of the Hulk punching a shark in the face, is a nice cover. #4 has an outlandish Venom variant cover. And #8 has a stylish, classic-looking Avengers variant. As part of Marvel NOW!, 2012 saw the relaunch of the Hulk franchise with Indestructible Hulk. The relaunch was a accompanied by various variant covers, of which the Joe Quesada sketch variant is the most sought-after. As of writing this, the Indestructible Hulk is in its early issues. The variants currently hold the most value, as with other contemporary series. One change in the current series is that the Hulk (Green, for the moment) works for S.H.I.E.L.D. The Future For Incredible Hulk Comics? Who knows where the series will go, but history (despite the many reboots and relaunches) suggests good things in the future for the Hulk. His all-star role in The Avengers movie will probably lead to new, improved attempts to bring Incredible Hulk comics to the silver screen, and that is only good news for the values of vintage Hulk comic books. The pair of badly-received Hulk movies in 2003 and 2008 temporarily dented the image of the franchise. But this was less the fault of the Hulk himself than the CGI-laden attempts of directors and editors to render the hero for 21st century audiences. The Hulk is a powerhouse superhero, whose roots go all the way back to 1962. He's a landmark Marvel creation, thought up by the Stan Lee/Jack Kirby duo. The premise of the Hulk, which no doubt makes him so compelling, is simple: inside of an ordinary man resides a sort of destructive monster, that emerges uncontrollably when its host is enraged. Obviously, we're thinking of Dr. Jekyll and Mr. Hyde, here. 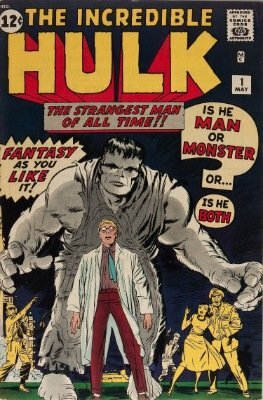 The only difference is that while Mr. Hyde was largely a debauched personification of an upright scientist's id, the Hulk, at least originally, represents uninhibited, primal aggression. Nor was the Hulk a deliberate creation; Bruce Banner simply began turning into the Hulk after exposure to that comic book standby, high-level radiation. The longstanding nature of this franchise has allowed for many permutations and expansions of the surprisingly rich possibilities represented by the Hulk. One way in which the series has explored these possibilities is with an almost dizzying array of Hulk manifestations, including Savage (or Grey) Hulk, Devil Hulk, and something called Merged Hulk! Iron Man is a founder member of The Avengers, and fights alongside Hulk several times. 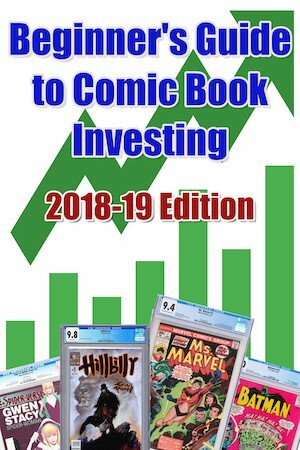 What are Avengers comics worth? Our detailed guide digs into the key issues, and gives you a great chance of valuing Avengers books in your collection. Learn the value of Marvel Comics characters who cross into the Hulk's world, such as X-Men, Amazing Spider-Man, Wolverine, Thor and Iron Man. What are the Hulk's appearances in Captain America comics worth? Find out in this detailed article. Find out the value of first appearances of key Hulk bad guys. We break out all 101 of TTA issues, including every Hulk appearance.